In high school, if you had asked me to point out Whitewater, Wisconsin on a map, I would have had no idea where to look. I was just a girl from the North suburbs of Chicago looking for a great place to go to college. I would have never guessed that I would end up in the small town of Whitewater at this University. Making this decision was not easy. 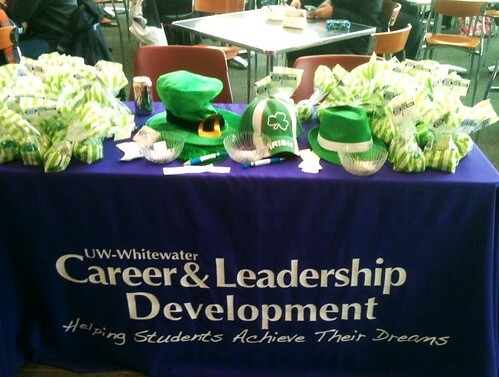 I knew that Whitewater had a great business school, there were not too many students, and it wasn’t too far from home. However, being from the North suburbs of Chicago, there were not a lot of people who came here for school. I would most likely be the only person from my high school coming here, a scary thought to any freshman. With that in mind, I decided to take the risk and attend this University. My random roommate ended up being from another North suburb that was just around 15 minutes from mine. We were both in the same boat. We knew that if we wanted to get the most out of our college experience we would have to get involved. This brought us to sorority information nights. We went through recruitment and joined Delta Zeta. As a new freshman, I would have never thought that joining that organization would bring me to where I am today. My sorority sisters never failed to encourage me to take risks, like the one I had taken when I chose to attend Whitewater. My junior year, I was elected as a co-recruitment chair for the Panhellenic Council, the governing body for sororities. I had no idea what I was getting myself into. Through this role I had the opportunity to attend the Association of Fraternal Values and Leadership conference in Indianapolis last winter. This conference gave me great insight into what it means to be a leader and how being Greek can help that. Shortly after returning from the conference I decided to take another risk and apply to be on the Homecoming Steering Committee, something I quickly realized was nothing like I thought it was going to be. As the first semester of my senior year was coming to a close, I quickly realized that all these leadership positions that I had held were ending. I knew that I wanted to spend my last semester on campus giving back to something that had given me so many opportunities and helped me grow from the scared, lonely freshman I was to the confident senior that I am now. So I took my final risk and accepted this position as a Social Media Intern. I am excited to spend my last semester here representing Career and Leadership by writing for this blog and posting from our various social media pages. I will be providing a student perspective on the scary process of searching for, applying to, interviewing for, and accepting jobs and internships. 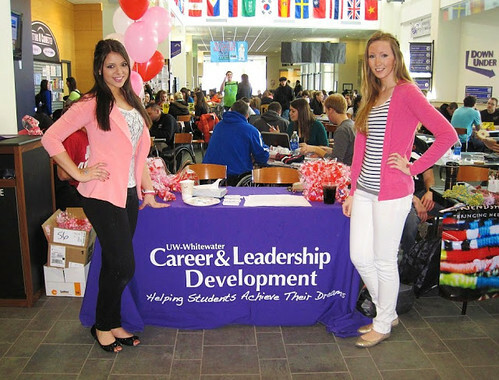 This post was written by Career & Leadership Development Leadership Advisor Melissa Grosso. Being a leader can be tough in the most perfect of circumstances…add technology into the mix and it can be a downright pain! One of my biggest pet peeves is when people are always on their phones or tablets in meetings or while they are having conversations with you and it what they are doing on their said phone or tablet has nothing to do with your meeting or conversation. My second pet peeve is that we have forgotten about the old school “face to face” meetings. Not everyone has a smartphone or uses social media, believe it or not! Branch out and use other “old school” methods. For example, if you want to communicate a conference schedule to the group, using an app like Involvio or Guidebook is great for those who have smartphones, but also remember that not everyone does. Have a handful of paper copies available for those who don’t have smart phones. There is nothing better than a face to face, in the same room conversations! Understanding when to have an in-person conversation is a skill that many people, due to technology, are lacking. Don’t send a text or email to ask how your performance at a job has been or that you need to resign from your position. It’s always best to have these types of conversations in person. Intent or meaning can be lost when NOT communicating face to face. LinkedIn is a great tool to network with, however, it drives me nuts when people I don’t know try to connect with me and they keep the generic “I’d like to add you to my professional network.” Well that’s awesome, but why should I connect with you, especially if I don’t even know you? I know there isn’t a lot of space in the box, but give the person you are trying to connect with a reason to connect with you – they will be happy to connect with you once they know the reason why. Everyone learns or hears about things differently! Don’t always use just one form of communication when trying to connect with others. Try to figure out their preferred method of communication and use it. It might take longer, but in the end you will have a much more connected group with individuals who know you care. Put down technology and have an honest uninterrupted conversation. These conversations can be the most powerful conversations where both people are engaged. The meaningful conversations that can come from being technology free are priceless. Do you have any other tips or tricks of the trade for living and leading in a technology-driven world? Last Friday, I wrote about five things you absolutely shouldn’t do on social media. We’re taking a positive turn this week to explain five things that you should do on social media. While nothing beats face-to-face conversation, and I encourage you to have conversations with your peers and friends over coffee and not over the Internet, here are some tips to help you when you are on social media. Social media is social. It’s about interacting with your friends, your followers, and your subscribers. While you don’t need to tweet, ‘Thanks for the follow!’ to everyone who follows you on Twitter, following them back is good enough. Following people or companies, or ‘liking’ their page on Facebook, who work in the field you want to get into is a really great idea. If they post something you’re interested in, retweet them, or comment on their post. And, if someone tweets or comments on your post, always comment back or favorite their tweet. When social media was becoming more and more popular a couple of years ago, many people thought it was just a fad. (Hint – it’s not. 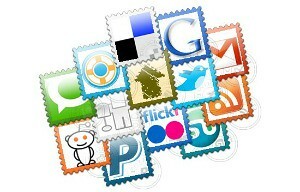 Social media is here to stay!) You might have jumped on the Twitter bandwagon because all your friends were on Twitter, and then tweeted twice since you started a profile in 2009. If you have a profile on a social media network, make sure you are active on it. Post regularly. You don’t have to go overboard and post 18 times a day. Remember – quality over quantity. We all know that potential employers will Google you, and then probably look at your Facebook and Twitter profiles. They will see your recent tweets about how a company recovered from a scandal, and how their public relations managers really pulled things together, and think, ‘Wow, this person is really on top of their game. They’re tweeting about this recent thing that happened in the PR field – that’s awesome.’ Be an opinion leader on social media. This one is a no-brainer, for most people, at least. Don’t be a bully, don’t over share, don’t gossip, don’t be disrespectful. If you are nice and polite on social media, potential employers will be more likely to take you seriously than if you were a bully. If you choose to make your social media profiles public, your professors, peers, acquaintances, and supervisors will be able to see everything. Make sure what you’re doing on social media is positive and respectful. I think that social media is a great way to express yourself. You can upload photos of your recent skydiving trip on Facebook, you can tweet about the funniest cat videos on YouTube, and you can blog about your new job. Different platforms require different ways to express yourself. For example, you wouldn’t post all your skydiving pictures on Twitter. That’s for Facebook! But you can still have fun with Twitter. Add a little personality when you tweet or post. If you’re retweeting something on Twitter, add a little comment before the RT. If you’re sharing someone’s post on Facebook, add your own opinion. Don’t be stiff – you can have fun on social media! Are there any other tips you think that are useful to do on social media? This post was written by Career & Leadership Development staff Nicole Golden and Jan Bilgen. For each of us, social media technologies create a number of opportunities to share, foster, learn and connect. With each opportunity there is a chance you might enhance your life or complicate it. Here are a few suggestions to insure that your social media interactions enhance your personal and professional life. Just because Facebook has a delete option on your posts and comments or on pictures doesn’t make it 100% true. Anything on Facebook, Twitter, YouTube, etc. can be downloaded, or emailed around to any number of others or sites. Think of all the great and witty tweets or posts you’ve seen and how they’ve gone viral. What if that was a picture of you doing something questionable? Or a post or comment that was hurtful? Written in anger? Think twice before posting. Ask yourself, what do I hope to “add” to my presence on social media with this? Separation isn’t always as a bad thing. If you don’t want to edit your statuses or think too hard before you click, consider having multiple profiles. Be very sure that those you “friend” or “follow” on each of those profiles should be there. I have a professional Twitter account where I only tweet work-related items of interest. LinkedIn connections that you accept should only be professional contacts if you choose to follow this approach. Because social media is an amazing tool to connect, most people start with friends and then blend in business connections, but consider the opposite. Seek professional connections first. Starting a professional “profile” on a social media outlets will not only let you create your personal brand it will let you protect it. In today’s world, it is much too easy to only connect and communicate with people via social media. However, it requires technical interest and resources so might not be everyone’s first choice in connecting. 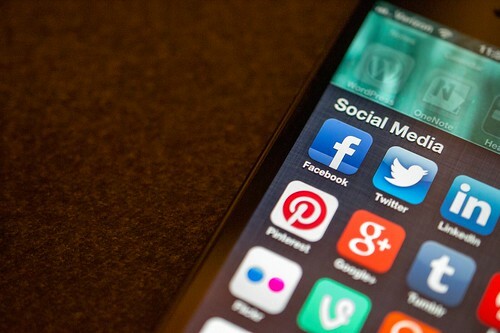 Social media contacts should broaden in number and in quality your relationships. Relationships must have direct connections in order to be improved and maintained. That means face to face opportunities, phone calls, Skype, etc. in addition to what you are posting and tweeting. In order to have impact on what others perceive about you, you must be able to interpret their non-verbals and have a higher chance of being understood. Time seems to slip away if you’re plugged in 100% all the time. Being too “plugged-in” can hurt the task at hand, like homework or work in general. You may seem distracted to those you are around and is seldom positive multitasking. Use of social media can also impact your friendships in a negative way. It oftentimes is a method that individuals use to drag others into their problems or arguments. They also use it in a passive aggressive manner. Beef with something? Find a non-social media way to vent or clear the air of frustration- talk in person. Remember, social media was created to connect and make the world more open and connected. According to Mark Zuckerberg, Facebook founder, “We hope to strengthen how people relate to each other and even if our mission sounds big, it starts small — with the relationship between two people.” So take a minute before you click, post and celebrate and make those relationships strong and productive! Raise your hand if you have Facebook, Twitter, or LinkedIn. Raise your hand if you’ve ever posted something you regretted. Now, I can’t see you reading this, but I can imagine you have posted or tweeted something you later regretted, whether it was bashing your former boss, your ex-boyfriend, your professors, your parents, or the driver who cut right in front of you during rush hour. Bad-mouthing (or should we call it bad-tweeting?) is just one common mistake that many people make online. The thing about having social media accounts is that it lets you ‘hide.’ It provides you a sheath. This can be both good and bad, but when it comes to entering the professional world, which many upperclassmen are about to experience, you shouldn’t have to hide behind the computer. This includes former coworkers and supervisors and current coworkers and supervisors. I know it can be tempting to post something about how the person who beat you for the big promotion sounds like a hyena when she laughs, but keep it to yourself or tell a close friend (someone who isn’t your coworker, preferably). Why not try talking to that person directly about what made you upset? It will show maturity and professionalism, whereas bad-mouthing someone on social media will make you seem immature and ignorant. Also, what’s worse than being called into your supervisor’s office because you tweeted about how your supervisor is just terrible at running meetings? You might get fired, so there’s that. This one should be common sense, right? Wrong. So many people my age swear to their heart’s content on Twitter and Facebook. It’s tasteless, unclassy, and extremely unprofessional. Also, keep slang terms and terms you’ve found on Urban Dictionary down to a bare, BARE minimum (I’m looking at you, YOLO). I understand that the occasional swear word can help in some extreme cases, but keep it to a minimum. Unless you plan on being a comedian. And if you are, good luck with that. This one should also be common sense, but I see this on Facebook way more often than I’d like to. I understand that many college students want to celebrate their 21st birthday, graduation, and St Patrick’s Day and Homecoming. I get it – I’m a college student, too! Take as many pictures as you’d like – but make sure that the worst ones don’t end up on Facebook. Employers may interpret your constant party pictures as wildly inappropriate and something that wouldn’t fit in to their office culture. We’ve all seen them – the infamous Facebook arguments. Someone posts about a controversial topic, someone else comments about it, more people comment, and all hell breaks loose. While these are undoubtedly hilarious, they’re also embarrassing if you’re caught in the middle of one. Facebook is not the place to have an argument, especially one about politics or religion. I know it’s hard to resist, but your professionalism depends on it! One way to let your feelings out is to write on the computer what you’re mad about. You can even go so far as enter it into the Facebook post box or Twitter tweet box, but before you hit ‘send,’ delete it. Getting your feelings out can make you feel a hundred times better. I’m not saying that you should not have a personality when you tweet – because by all means, tweet to your heart’s content! But be smart about what you post. Your social media presence should be squeaky clean, especially for those of you entering the workforce! This post was very negative, but next week’s post will be all positive! It will be all about how to post things of substance, how to connect with potential employers, and how to have a positive experience on social media. For the last Friday Favorites of the school year, I’ve rounded up five of my favorite events that Heather and I put on while we were the social media interns for the 2012-13 school year. Enjoy! 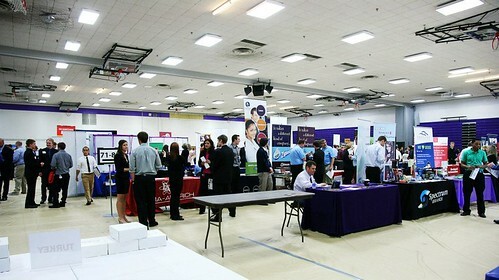 The first big event that Heather and I worked at was the Hawk Career Fair in September of 2012. I was live tweeting and Heather was taking pictures of students and employers. To see more pictures, visit our Facebook page. Heather and I hosted a Halloween Table at Esker and the UC with a custom-made Face-In-Hole! 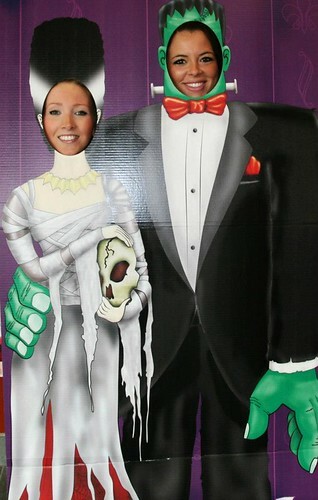 It was a huge hit and Heather snapped a lot of photos of friends pretending to be Frankenstein and Mrs. Frankenstein. Heather and I hit it off right away. I’m so lucky to have had such an awesome coworker. We bonded over many things, but the one thing we really had in common was our love for social media. 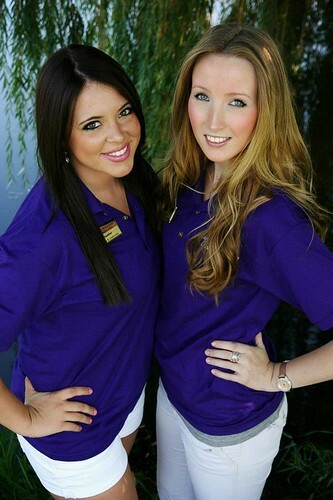 We went on a little photoshoot down by the lakefront last semester and got some great pictures! Heather and I did a lot of tabling during different times during the school year. 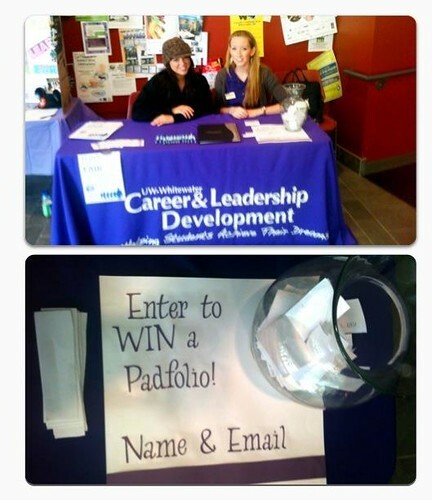 It was really important for us to get out name out and to represent Career & Leadership Development in a positive light, so many of our tables included free goodies and chances to win padfolios. 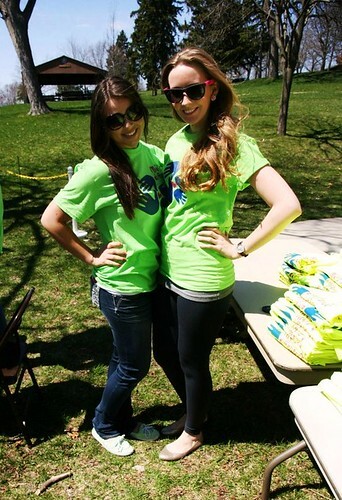 The last big event Heather and I worked at was Make a Difference Day. I live tweeting and Heather took pictures during this event. I know I can speak for Heather and say that we’ve had an amazing and successful school year. This internship was a dream come true for both of us and we gained so much experience and knowledge. I hope you’ve enjoyed the posts on this blog. Be sure to check it out next year for even more great blogs posts! As I look back on this social media internship, I can’t help but think about when I interviewed for this position. I was studying abroad in Ireland in the spring of 2012 when I received an e-mail about the social media position. I utilized social media to its fullest extent when I was abroad. I didn’t have a cell phone, so using social media and blogging was one of the only ways I could keep in contact with my friends and family back home in the states. I wanted to get better at using social media, too, so this internship was a dream come true. 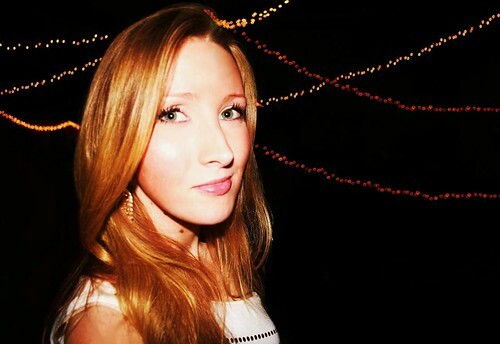 I managed a blog that semester when I was studying abroad, called The Book of Kels. I knew I wasn’t a fantastic writer by any means, but I definitely wanted to get better at blogging. The afternoon that I had my Skype interview with Laura Jacobs, I was so nervous! I even posted notes around my computer screen so I could reference them. Thankfully my Skype interview went smoother than expected, and a few days later, when I was traveling in Poland for the weekend, I received the congrats! e-mail. Little did I know, that spur of the moment decision to apply for a social media internship did me wonders and changed my life for the better. I always thought that I wanted to travel abroad, to take pictures and write for a magazine, to basically live the dream life. I spent this whole year using Hootsuite and blogging like a madman and I can safely say that being an international reporter isn’t my dream any more. Being a social media specialist is my dream (I know, how dorky does that sound?!). I know I can speak for Heather and say that her and I had a really great year. We hosted tables in the UC, had fun contests, attended diversity events, and made friendships with other Career & Leadership Development interns. I really enjoyed live tweeting during the Hawk Career Fair in September and during Make a Difference Day. This internship was a dream come true. I now know what I want to do after I graduate, and I have Career & Leadership Development to thank for that. I will be the career social media intern for the 2013-14 school year, but next year I will be focusing on blogging, so be sure to check out the Career Spotlight Blog for some great posts! I’m ecstatic that I will have this internship again next year and I can’t wait to see what great things will come from it.